I once visited a university in southern Maryland that had peacocks roaming the campus. I found this interesting, but not enough to make me want to attend the school, considering the students informed me that the only thing to do there was hang out at Walmart (and chase peacocks). So, I went to Coastal. They are actually called peafowl, as a species. 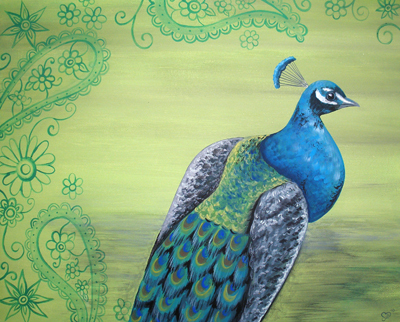 This painting is of a peacock (male), the peahen’s (female) coloring is gray or brown. According to wikipedia, the male displays it’s extravagant tail to attract the female. Just beautiful! Makes me think of the beauty the spring will have to offer! I can’t believe you’re at the halfway point with your paintings! Keep up the good work! You don’t have to thank me. I need to thank you for showing me a new painting each day to warm my heart and soul!